Red roof moss with numerous sporophytes. Photo by Ian Cruickshank. Red roof moss shoots are usually unbranched and reach 2.5 cm tall. The lance-shaped leaves of this reddish-green moss are contorted when dry and spread out when moist. The leaves are sharply pointed and have rolled edges. 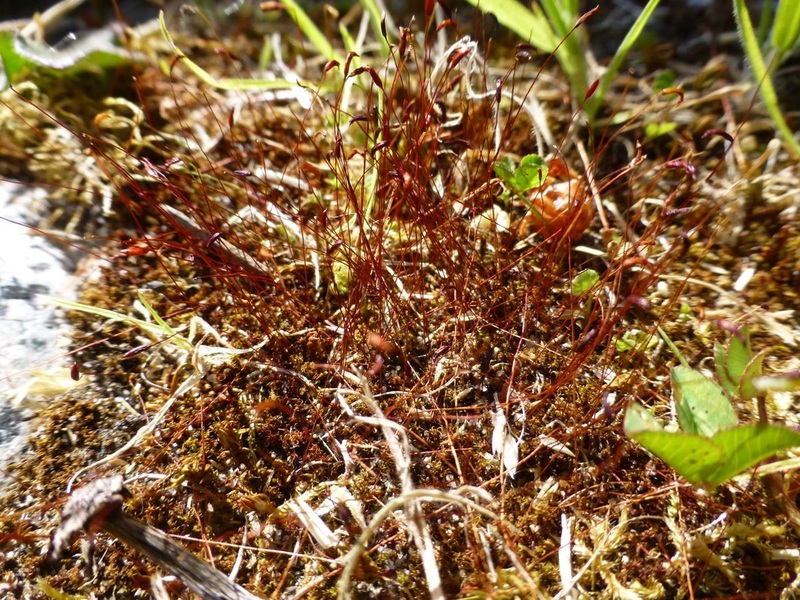 Sporophytes are common; they grow from the tips of red roof moss shoots, and appear to tower over the rest of the plant. 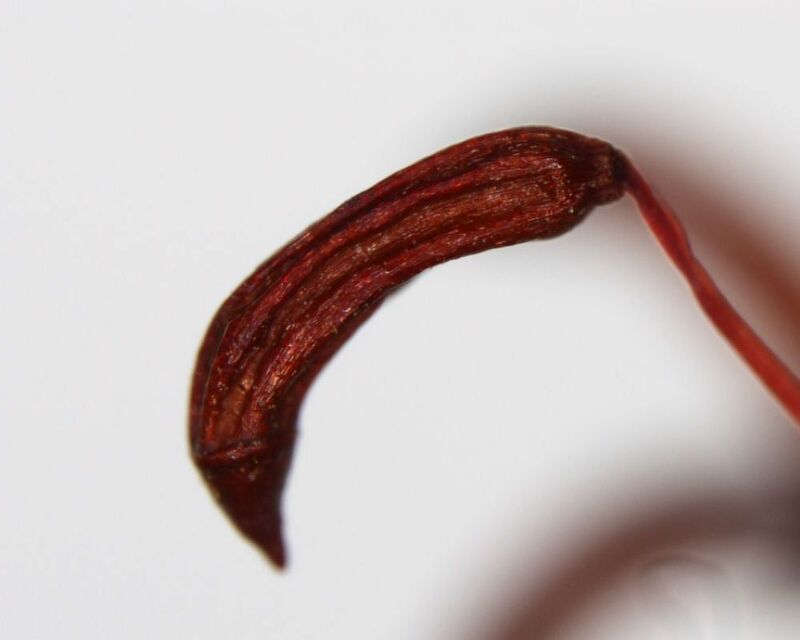 The sporophyte capsules are ribbed and bent at a strong angle to the stalks. 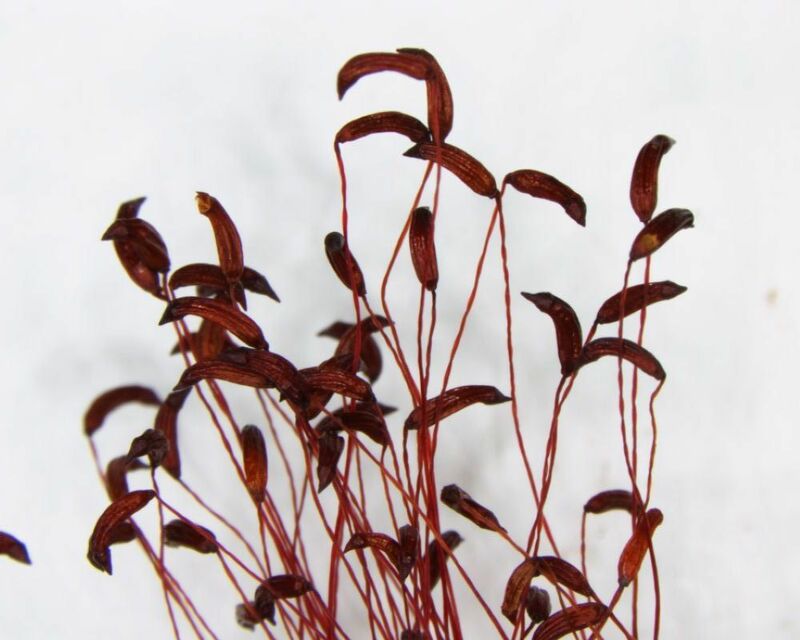 The sporophytes change from reddish-green to reddish-brown or purple with age. Red roof moss is fairly easy to recognize when mature, however plants without sporophytes may require close examination of the leaf. See the UBC Bryophytes species page for more information. Click here for macro photos of this species. This common moss forms mats or tufts in a wide range of habitats worldwide, from the arctic to the antarctic. It is particularly common in disturbed locations and areas that dry out quickly, and may be found growing in sidewalk cracks or on roofs. In undisturbed locations it tends to grow on soil or decomposing logs. Ceratodon purpureus (Hedw.) Brid. In Klinkenberg, Brian. (Ed.). E-Flora BC: Electronic Atlas of the Plants of British Columbia. Lab for Advanced Spatial Analysis, Department of Geography, University of British Columbia, Vancouver. Accessed 06/01/2015. Ellis, S. Ceratodon purpureus (Hedw.) Brid. Introduction to Bryophytes. Biology 321, Department of Biology, University of British Columbia, Vancouver. Accessed 06/01/2015. Pojar, J. and MacKinnon, A. (1994). Plants of Coastal British Columbia. Vancouver, BC: Lone Pine Publishing. P. 478.